The Upper House passed the Bill with 149 'ayes'. A day after Lok Sabha passed a landmark bill to provide 10 per cent reservation in jobs and education for the general category poor, the Constitution (103rd Amendment) Bill was passed in the Rajya Sabha on Wednesday. The Upper House passed the Bill with 149 'ayes'. The bill will provide reservation for economically weaker section of the society in higher educational institutions. With most parties backing the proposed legislation, the government has described the bill as "historic" and in the country's interest. The opposition, including the Congress, dubbed the proposed law as a political gimmick that may not stand judicial scrutiny but came around to support it during voting, underlining the huge political import of the measure aimed at placating upper castes. In Lok Sabha, as many as 323 members voted in support of the bill, which seeks to amend Article 15 and 16 of the Constitution to enable reservation for the "economically weaker" sections in the general category. Three members voted against the bill. Prime Minister Narendra Modi and Congress president Rahul Gandhi were present in the Lower House when the bill was passed. The Rajya Sabha has been adjourned sine die. Thank you for staying with us. For latest updates, please visit Zee News. Voting on amendments going on for the Constitution (124th Amendment) Bill, 2019 in Rajya Sabha. Rajya Sabha passes Constitution (124th Amendment) Bill, 2019 with 149 'ayes'. The bill will provide reservation for economically weaker section of the society in higher educational institutions. Rajya Sabha negates sending the Reservation Quota bill to Selection Committee. Lok Janshakti Party Ram Vilas Paswan addressing the Rajya Sabha. "The Mandal Commission provision of 10% reservation for the economically weaker category was declared unconstitutional by the Supreme Court. If a nine-judge bench held it unconstitutional, how can you amend the constitution?" Sibal in RS. "Derek tweets often on cricket. I want to tell him sixes are hit in slog overs," says RS Prasad. RS Prasad to Congress: All those asking why this being implement now, who asked you not to execute this quota during your tenure? BJP leader and law minister Ravi Shankar Prasad addressing the house. All this is because of the election which is in next 100 days, says Kanimozhi. "How did the government decide on the 10% number? Was any research quoted? How are you justifying the number? How will this help the population? The government is not saying the exact number. We're reading about an 8 lakh number, but the government did say it," says Kanimozhi. Kanimozhi raises the lack of employability and social injustice while opposing the Quota Bill. DMK leader Kanimozhi speaking in the Rajya Sabha. Shiv Sena member Anil Desai speaking in the RS. Nominated RS member Dr Narendra Jadhav takes the chair. RJD leader Manoj Kumar Jha speaking in the Rajya Sabha. Communist Party of India (Marxist) Elamaram Kareem addressing the house. Prasanna Acharya, Biju Janata Dal: BJD supports the quota bill but asks if the House is competent to make such a law. Derek O'Brien reads out Narendra Modi's 2013 speech, saying: "I am missing the Prime Minister so I am quoting him." "Government is bringing this Bill knowing fully well that it cannot be implemented," he added. We have a single party govt with a confused maximum programme. Derek O'Brien, TMC: This bill is an acknowledgement of the guilt of the government. They have not been able to generate any jobs hence they are bringing this Bill. The youth of the country ask, "where are the jobs?" Derek O'Brien, TMC: This Quota Bill is a betrayal of the poor as well as youngsters. We have serious objections to this bill. Will this bill pass judicial and legislative scrutiny? Derek O Brien, Trinamool Congress: Disgusted, angry that Parliament has been disrespected by the government. A wrong method has been used to bring an amendment in the Constitution. Ramgopal Yadav, Samajwadi Party: SP supports the bill but there are no new jobs being created in the country. When the employment generation is so low, what is the point of bringing in such a Bill, Yadav asked. Deputy chairman Harivansh said it will only be taken up after the discussion, prompting the opposition members to raise further slogans. Parliamentary Affairs Minister Vijay Goel accused the opposition of seeking to stall the passage of the bill that has been brought for the welfare of the poor. This was strongly opposed, with Congress member Anand Sharma saying his party supported the bill, and Manoj Jha (RJD) stating the charge was incorrect and that the bill was "interference with the basic structure of the Constitution". Congress member Madhusudan Mistry raised a point of order saying the bill was incomplete as the statement of objectives were not there. He asked what was the urgency of the government in bringing this bill in such haste. The deputy chairman said Chairman M Venkaiah Naidu had already granted two-day exemption for introducing the bill and the same should be taken up. 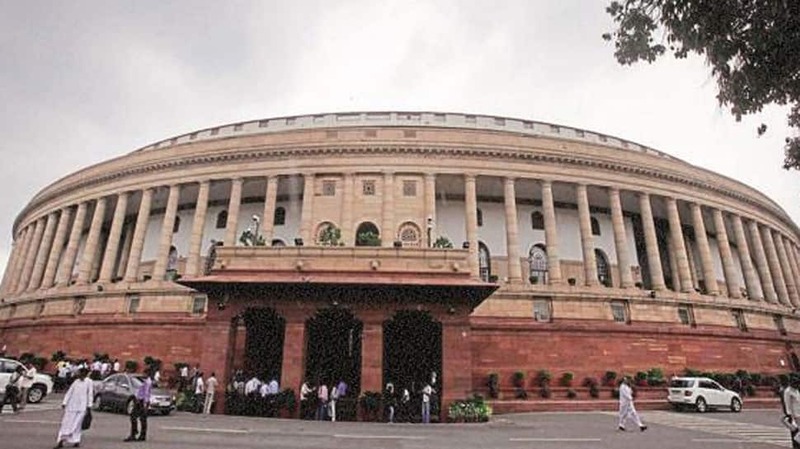 The Congress and other opposition parties strongly protested in the Rajya Sabha and demanded to send 'The Constitution (124th Amendment) Bill, 2019' to a select committee, after the government introduced the key legislation. The Congress, DMK, RJD and Aam Aadmi Party were in the well of the house and continued to raise slogans against the government. DMK member Kanomozhi demanded to send the Constitution amendment bill to a select committee for further scrutiny and sought division on her motion. Her demand was supported by members of some parties including D Raja (CPI), with Congress also asking the deputy chairman to take up her plea first and allow division on her motion. Rajya Sabha adjourned till 2 pm after uproar over general category quota bill. A debate over the Quota Bill is currently underway. A time frame of three hours has been set to debate over the Bill. While Congress stated that the Bill was passed in a hurry, Union Minister Thawar Chand Gehlot said, "This bill will uplift the poor of the nation. This decision has been taken with thorough consideration." The opposition has come into the well of the House as the Minister speaks on the Bill. "A historic bill was passed in Lok Sabha. The Lok Sabha took a landmark decision by passing the Quota Bill. Have full confidence that the Bill will be passed in Rajya Sabha today too. By passing the Bill our principle of ‘Sabka Sath Sabka Vikas’ has been further strengthened," said Prime Minister Narendra Modi in Solapur, Maharashtra, addressing a rally. Union Minister Thawar Chand Gehlot introduces in Rajya Sabha the Constitutional Amendment Bill to give 10 per cent quota to upper caste poor in jobs and education. Rajya Sabha adjourned till 12 pm amid the ruckus. On the uproar in the upper house Arun Jaitley said, "The country expects the House to function. As per normal working days, we should have been working, on most of them the House stood adjourned. There is one extra day to consider legislations." The quota bill will be introduced in the upper house first. Anand Sharma, Congress in Rajya Sabha: "The way the House proceedings were extended without the consent of the opposition parties was not right. The situation now is such that there is no dialogue between the opposition and the government. The government is foremost responsible if the House doesn't function. Uproar in Rajya Sabha over government extending Parliament session by a day. Minister of State for Parliamentary Affairs Vijay Goel told Rajya Sabha that the government wants to extend the functioning of the House by a day as there are important bills to be passed. However, the Opposition said that the government has extended the session of the House illegally. AIADMK to stage a walkout in Rajya Sabha today. There are 13 members of the AIADMK in the house. The bill will be passed by the upper house even if AIADMK decide to walk out. The bill needs to be passed by 2/3rd majority. The SP, BSP and Congress will support the passage of the bill. The opposition parties are likely to question the Narendra Modi government on Wednesday in the Rajya Sabha, where the ruling block lacks majority, over the timing of the general category reservation bill and have asked all their members to be present in full strength, as reported by news agency PTI quoting sources. Sources told PTI that they are likely to take a tougher stand in the Rajya Sabha on the basis of their sheer numbers. With 73 MPs, the BJP has the highest number of seats in the house, which currently has a strength of 244. This is followed by the Congress which has 50 members. The sources also told members of opposition parties are upset over the extension of the Rajya Sabha proceedings by a day and will protest in the house. The sources said while the Congress is supporting the bill, other opposition parties may create hurdle in its passage. BJP leaders, however, said that if opposition parties do not extend support to the bill, they will have to face voters' wrath in the 2019 Lok Sabha elections. Making an intervention during the debate, Union Minister Arun Jaitley informed the House that this constitutional amendment bill will not go to state assemblies for ratification, meaning that it will come into force after the Upper House passes it and the President gives his assent. Certain constitutional amendment bills require ratification from 50 per cent of state assemblies to come into force.